Boun Lod Continues to do Well. More Surgery Scheduled for November 2013. As mentioned previously, Boun Lod had surgery in July 2012 at the Shriners Hospital in Cincinnati to implant a “balloon” under her scalp that was to be injected with saline to gradually stretch her scalp. For the rest of the summer and fall, Boun Lod made regular visits to the hospital for the injections. During that time, Boun Lod also enthusiastically attended the Hospital’s school, and enjoyed the daily “Child Life” program. Boun Lod made good progress and, in early October, the surgeons removed the balloon and “adjusted” Boun Lod’s scalp. By late October, Boun Lod had healed sufficiently that she was given the go-ahead to return home to Lao. As far as Boun Lod was concerned, the November 3 return date was perfect as she was able to celebrate Halloween in Cincinnati! Happy to be going home soon! October 30, 2012. On her return home, Boun Lod resumed her English studies at Vientiane College. She continues to improve her marks, and now gets mostly “A’s”. Boun Lod is also catching up with her Lao education. Because she has spent so much time away from home, she’s behind her peer group, and especially so in Lao language. It was decided that the best course of action would be to have Boun Lod study with a private tutor, and she’s been doing that since the New Year. It’s just about time for Boun Lod to return to Cincinnati for further work on her scalp, eye, and nose. The Cincinnati Shriners Hospital has also contacted the Shriners Hospital in Lexington, Kentucky to arrange for more work to be done on Boun Lod’s prosthetic arms, and for Boun Lod to continue her training on their use. 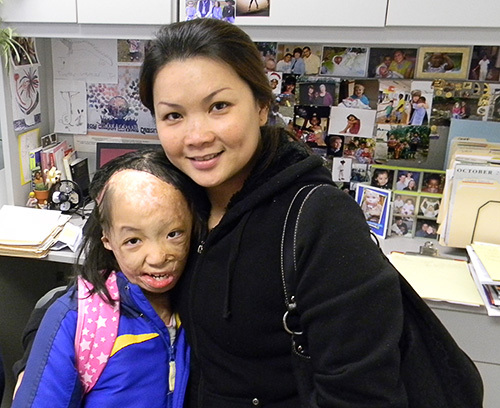 Boun Lod is scheduled to return to Cincinnati in late October, with her first surgery to take place in early November. The doctors expect Dr. Yakuboff, the Chief of Plastic Surgery, expects this round of surgery and treatment to take six to nine months approximately 12 months. It’s been a long haul for Boun Lod and her family, and it will be hard for Boun Lod and Noi to be away from home again, but the family is determined to do all they can to help Boun Lod. The Shriners Hospitals, and particularly the Cincinnati Hospital, continue to be terrific, and we can’t say enough about the exemplary kindness, attention, and care that Boun Lod receives. This entry was posted on July 22, 2013 at 2:11 pm and is filed under Uncategorized. You can follow any responses to this entry through the RSS 2.0 feed. You can leave a response, or trackback from your own site.